The “digital workplace” sounds good. People like the way the words resonate. It generates enthusiasm. Yet, when you need to explain to senior management in 2 minutes, it’s a little harder. What does it really mean? I’ve sketched the diagrams you see here and have tested them in numerous contexts over the last few months. They work well, both in potentially conflictual meetings with internal stakeholders and with 5-minute talks to senior managers. I use them as a build-up, talking through the evolution from the first model to the last. I’ll explain how I use these diagrams and also show you how you can use them to define your home page strategy. Of course there’s much more you can do with them too, especially concerning governance! Model A is where most organizations are today: three distinct worlds, each providing value in different ways. Model B is a big step forward, and often the trigger for senior management interest when collaboration becomes part of the intranet. That often marks the arrival of business support as one of the intranet strategy drivers. 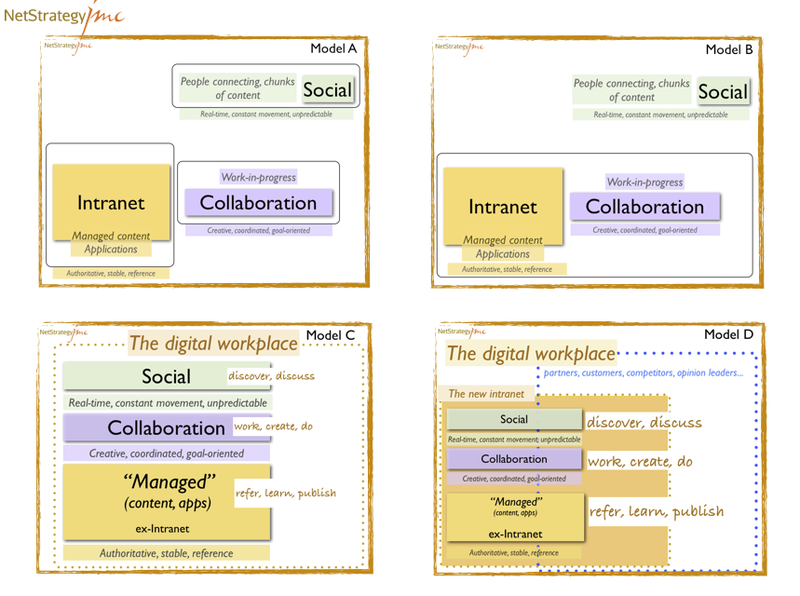 Model C has re-positioned the “ex-intranet” as part of the overall digital workplace. Here, the networked collaboration of discovering and discussing, along with the structured, project-driven collaboration live side by side with the managed content and applications of the “ex-intranet”. Model D is the most future-oriented. It considers the digital workplace to encompass not just the internal world but parts of the external world as well. This makes the “new intranet” a blend of managed, collaborative and social content. 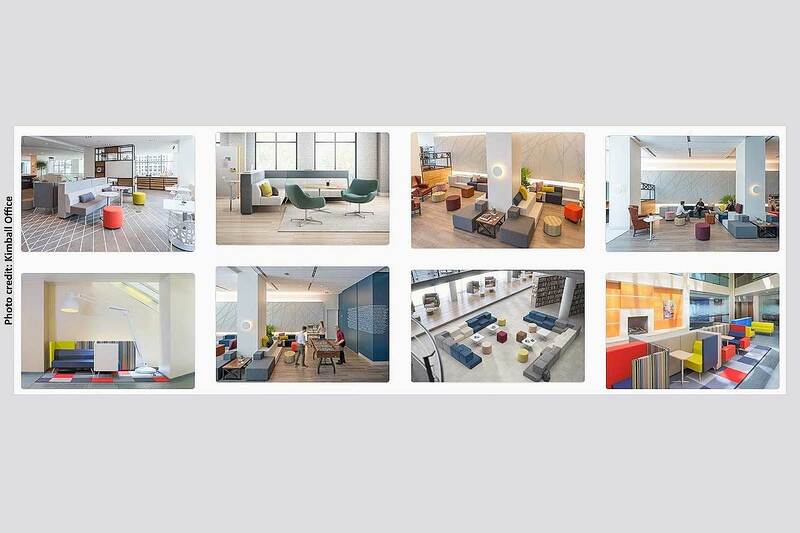 The digital workplace itself has become a platform for the extended enterprise. 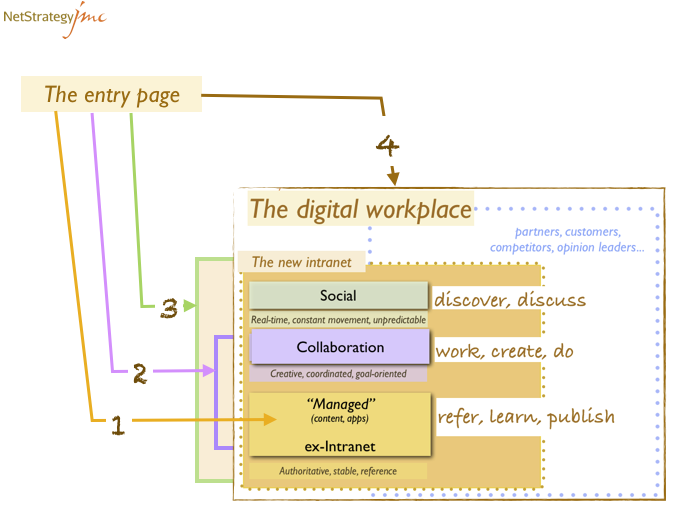 This second diagram has been adapted for a case where an enterprise is re-thinking the entry point into the “intranet” and wondering what to include. The entry page by definition will reflect one of the 4 models. It is critical to get it right. If it is the front door into a full-blown digital workplace, then it should signal that from the content people see on the page. In models A and B, it is highly likely that people in your organization do not all use the intranet home page as their entry point. Nowadays, it’s becoming artificial to talk about the intranet home page. We need to be talking about the door into the digital workplace. 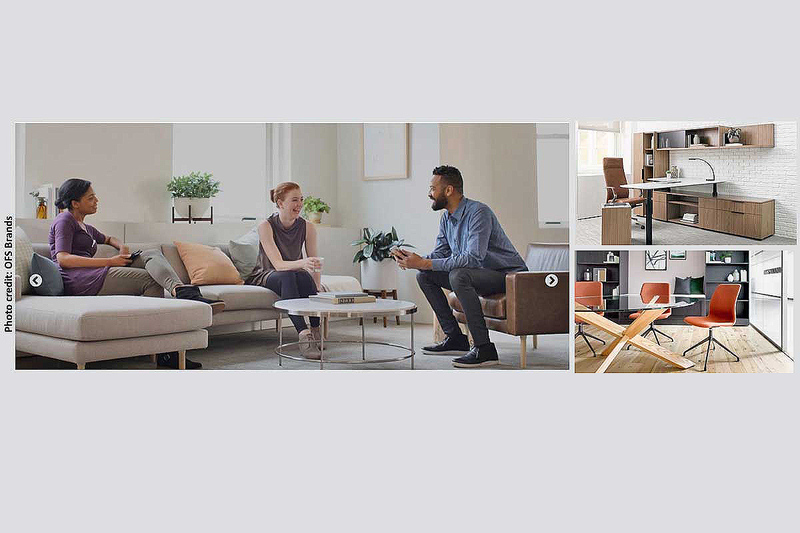 So, where are you at in your digital workplace? Previous PostIntranet manager, a commodity? 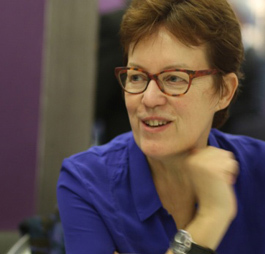 Next PostWho is steering your digital workplace?